Pininfarina has announced the unveiling of a new special project carrozzeria during Pebble Beach Concours in August 2008; named “Pininfarina Hyperion”, is based on a Rolls Royce Drophead Coupè and is an homage to the great pre war cars. Pininfarina has announced the unveiling of a new special project carrozzeria during Pebble Beach Concours, August 2008. The project, named “Pininfarina Hyperion”, is based on a Rolls Royce Drophead Coupè and is an homage to the great pre war cars. Its style, size and overall presence is truly unique in modern day car production, firmly rooted in the history and heritage of the two Brands at the core of the project. The private client who has commissioned the car, has agreed to display this latest Pininfarina creation at the prestigious American event. Pininfarina Hyperion is one of the Pininfarina driven projects to be presented in 2008. In fact it follows the presentation of the technologically advanced and avante garde Sintesi concept car at the latest Geneva Motor Show and it makes its début shortly before the unveiling of the highly anticipated electric car concept, the Ferrari California and the Maserati Quattroporte MY ’08 - all designed by Pininfarina - at the Mondial de l’Automobile in Paris. 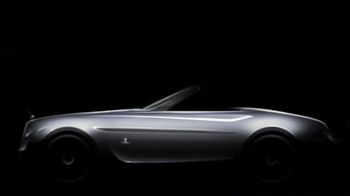 Pininfarina with Hyperion once again demonstrates its creativity and ability to interpret the different requests of the motorcar industry.